Bang Bang Shrimp. Need I say more? I LOVE the Bang Bang Shrimp appetizer at Bonefish Grill. Actually, it’s pretty much the only thing I get when I go there… the appetizer portion is a great entree size for me! I’ve been wanting to make this at home for a while now, and this afternoon I decided to try it out for dinner tonight. As for the shrimp, in the future: I’d probably use medium-sized shrimp [it’s what I ideally wanted to use when I made this at home], but I had the extra-large sized shrimp (26/30 count) at home today… so that’s what I ended up using as I decided just a few hours prior to try to make this at home. Season your shrimp with black pepper, garlic powder, and cayenne pepper. Add in salt if you want as well, I didn’t think it was necessary with the sauce in the final product. Combine the mayonnaise, chili garlic sauce, sugar, and rice vinegar in a small bowl. I let mine chill in the fridge in the meantime. This helps the sauce stick to the shrimp. Beat your egg, and mix in the milk in another bowl; set aside. Next, combine your flour, panko breadcrumbs, black pepper, onion powder, garlic powder, cayenne pepper, and basil in a separate bowl. Coat your seasoned shrimp with the flour/breadcrumb mixture. Then, coat in the egg/milk mixture before you coat them in the flour/breadcrumb mixture for a second time. Line them on a plate until all of your shrimp is breaded. Put your coated shrimp in the fridge for about 20 minutes. I’ve heard that this helps the breading to stick to the shrimp while they are frying, so I tried it out… and it did! I was worried about the panko falling apart. Heat your oil [on high] [in a frying pan, deep fryer, whatever]. When oil is hot, fry your shrimp in batches for about 2 to 3 minutes [or until they are golden brown]. Whenever I fry anything [which is not often], I always line my dish with paper towels to help absorb as much of the oil as possible. When all of the shrimp has been fried, transfer the shrimp into a [large] bowl. Let the shrimp cool down for a few minutes before adding in about a quarter of a cup of the sauce you made earlier [that is chilled] at a time and mix/toss gently to coat your shrimp. I added in the sauce a little at a time to make sure I had the right consistency of sauce. 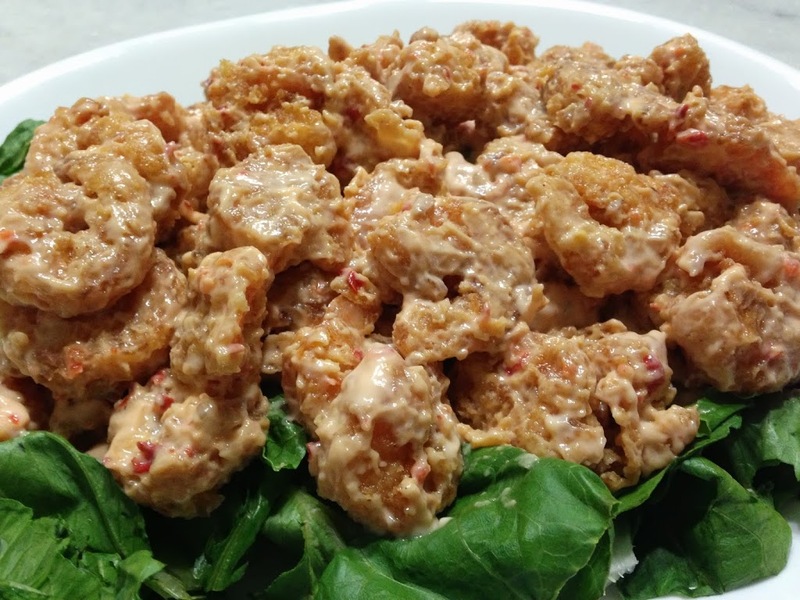 I served my homemade version of Bang Bang Shrimp over a bed of romaine lettuce, but anything similar would work well — iceberg is one I’d probably use if I had it on hand. For presentation purposes, garnish with chopped green onions if you would like [I didn’t do that today]. Make the sauce first [and put it in the fridge to chill]. Next, bread the shrimp [then put the shrimp in the fridge too]. Wait to add the sauce to the shrimp until once the shrimp is a little cooler. Gently toss. Update: So when I made this for a second time, I decided to try the coating for the shrimp a different way — the way I do it for my chicken tenders/nuggets/fried chicken. Both are delicious, but I like my simple [one method for all] way more and have used that each time I’ve made it since. So what I do is: when I’m ready to fry, I add in a [beated] egg[s] to the marinated shrimp [same way as listed above]. Separately, in a ziploc bag [for easy cleanup], I add in flour and season it with black pepper, garlic powder, paprika, chili powder, and cayenne powder. Next, add in the shrimp to the ziploc bag, seal… and shake to coat all of the shrimp. You may need to do do this in batches depending on how much shrimp you are working with.